My last job finished on Friday, 27 May 2011 and with no other employment in the near future, I decided to fly to Sri Lanka to visit sacred places I haven’t been before and then visit relatives in the United Kingdom. I might stop in Bangkok to see friends while returning to Perth. This trip is a tour and not for meditation. I depart this Friday, 3 June, arriving in Sri Lanka on Saturday 4 June. I may stay overnight at Negombo before taking a bus to Kandy. I plan to visit Ven. Nyanatusita at the Forest Hermitage for a few days and then visit Na Uyana Aranya to pay respects to monastics. I may not stay overnight there though. Then I might go on to Matale to see the Aluvihara and to Anuradhapura to pay respects to the ancient Bodhi tree, stupas and various ruins. I shall continue to blog my travels and post photos. I came to Ubon Ratchathani for a short visit to the International Forest Monastery (Wat Pa Nanachat). Despite 27 years visiting Thailand this is the first time I’ve been to this famous monastery. I am glad to have finally made it. The community at the monastery is preparing for an important meeting of senior monks (Thera) from the international network of forest monasteries (in the tradition of Ajahn Chah). This meeting is due to begin next week. I met briefly with the “Guest Monk” – who has the duty of anwering queries from temporary visitors such as myself. Ven. Nyaniko Bhikkhu told me he ordained at Abhayagiri Monastery in Redwood, California, United States seven years ago. This trip helped to straighten out some misconceptions I previously held about Wat Pa Nanachat/International Forest Monastery and the international network. I had previously assumed that the views of Ajahn Brahm from Bodhinyana Monastery in Perth, Australia and Ven. Sujato from Santi Forest Monastery, New South Wales, were representative of the entire forest monastery network. When living in Australia, I did not wish to visit either of these Australian monasteries due to controversial views expressed by Ajahn Brahm and Ven. Sujato. This was despite living close to both monasteries at various times during the past 15 years. Ven. Nyaniko told me that both Ajahn Brahm and Ajahn Sugato have chosen to leave the network for the time being. I did not pursue the details of this break nor ask questions about what may be the cause etc. I found out belatedly after returning to Bangkok. It seems that Ajahn Brahm and Ven. Sugato may have hurt the network as a whole. Maybe one day they may both reconsider their views, apologise and return to the network. I felt relieved to hear that the forest monastery tradition is open to many different Buddhist meditation practices including Mahasi method vipassana. I also apologised to Ven. Nyaniko for previously considering Ajahn Chah monks to be overly obsessed with vinaya (monk’s disciplinary rules) and the outward appearance of monastic life with insufficient focus on meditation and spiritual attainment. I realised many years ago that this was incorrect and was glad to be able to apologise face to face with Ven. Nyaniko as a representative of the Ajahn Chah lineage. Another reason for relief. On Monday evening, I left Bangkok on an overnight train and arrived in Ubon Ratchathani on Tuesday morning (yesterday). I began writing this at an Internet cafe in Ubon near the Warin Markets. The returning train departed Ubon around 18:30 Wednesday evening and arrived in Bangkok around 06:00 Thursday morning. I paid for second class air con. sleeper, lower bunk. It is fairly comfortable though if the bed was another 10cm longer it would be a better fit. I stayed last night at the Pathumrat Hotel. I booked it via Agoda and got a big discount. The room was very comfortable and way above my usual standard of accomodation. I had air con. TV, ensuite, a fridge and so on. At the Ubon train station just before boarding, I met Brian Johnson, a fellow Dhamma tourist, who had just finished a 2 or 3 week (not sure of the length of time) period living at Wat Pa Nanachat. I didn’t notice him when I was there. He is a few months older than me and we boarded the train and swapped stories about our Dhamma experiences. It was one of those rare moments when I felt as though I’d met a long lost brother. We talked fast and four hours passed quickly before a train official said it was time to sleep and go to our separate carriages. I hope to meet Brian again one day or at least to have e-mail contact from time to time. Brian has a website with useful information about the teachings of Ven. Pa Auk Sayadaw. I encourage readers to check it out. www.paauk.org I promised Brian I would post an article about Dhammanusari and Saddhanusari before I fly to India on 3 December. On Tuesday, 3 Nov. this week, I finished an eight week retreat that began when I returned from the visa run to Laos. People have asked me what I gained from the vipassana retreat or what did I learn or what seems different now and so on. The changes seem subtle though generally I feel content and less restless than the Myanmar vipassana retreats. I also got better at noting desire as it arose and passed. I feel more confident. During the retreat I only spoke with my current teacher, Pi Yai and only when necessary. After the retreat people who live in Section 5, Wat Mahadhatu (Thai version) told me they are impressed with my determination to meditate for 8 weeks. My routine was to wake around 3:30 am or 4 am, go down to the meditation room and meditate until breakfast after dawn at 6 am to 6:30 am. Then I continued meditating until lunch around 11 am. After lunch I continued meditating until around 9 pm. Most of the time I alternately walked one hour and sat one hour. This is the same as my experience of vipassana meditation in Myanmar. However, I did spend some periods sitting longer such as 1.5 hours, 2 hours, 2.5 hours and maxed out at 3 hours for one sitting session. The intervening walking meditation sessions during these periods varied from 30 minutes to one hour. There was a lot of pain arising and passing and I prefer to not sit so long in one session for a vipassana retreat. Even so, I developed equanimity, persistence, truthfulness, resolution and concentration by sitting for these longer periods. I also spent some periods alternately sitting for only 30 minutes and walking 1.5 hours. This built a lot of energy and also sprained my left Achilles tendon. This may not have happened walking on wood panel floors or carpeted floors. The meditation room floor was covered with hard ceramic tiles – no give at all. I recovered from the sprain in a few days by doing standing meditation instead of walking meditation and also by doing “walking on the spot” on top of a soft mat. Pi Yai is an excellent meditation teacher. I have known her since 1983. She has worked voluntarily at Section 5, Wat Mahadhatu for around 25 years. 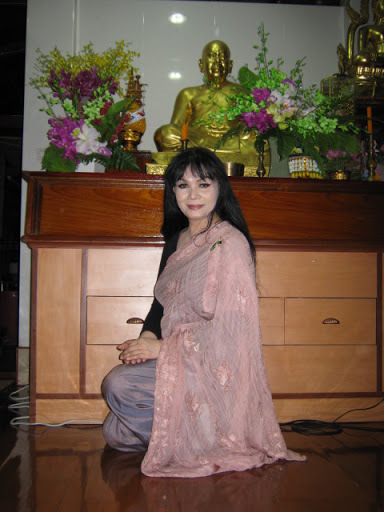 She teaches meditation to Thai people and to international visitors who drop in. I heard that Section 5 is mentioned in several travel guides. There is no fee or charge for the teaching. It runs on the traditional voluntary donation basis. Pi Yai receives no payments from Wat Mahadhatu for teaching meditation or for any of the other work she does there. 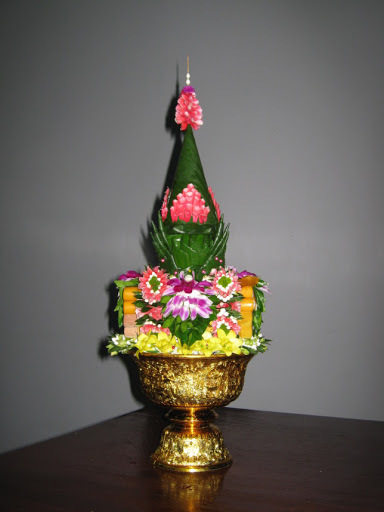 ABOVE: One of Pi Yai’s intricate flower arrangements prepared as a an offering for a bhikkhu ordination at Wat Mahadhatu, Bangkok – November 2009. 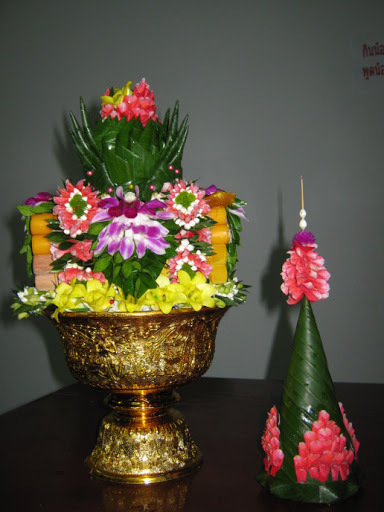 It consists of fresh flowers, banana leaves, candles, incense and a coloured aluminum bowl. The image on the right demonstrates the removable cone-cap. Along with other volunteers, Pi Yai prepares and serves food/beverages, purchases and arranges flowers, counsels visitors and cleans up. She works seven days a week arriving at Wat Mahadhatu before 9 am and heading home after 9 pm. She receives a small stipend from her aged father which she uses to pay rent and cost of commuting to Wat Mahadhatu each day. I am confident that Pi Yai has a high meditation attainment. When I entered Thailand, I didn’t get 90 days visa that I expected, only 60 days. The multiple entry tourist visa obtained in Vientianne allowed me to extend it by 30 days in Bangkok by just going to the Immigration Office. I did this yesterday (Friday, 6 Nov) and it cost 1900 baht. By the way, the Immigration Office recently moved from the central location near Sarthon Road to a far northern part of Bangkok near Chaengwatana Road (near Lak Si). Their new location includes many government offices in a huge, I mean really massive, office building. It is all quite new and very impressive, except that it is so far out of the centre of Bangkok. I asked a few questions about my multiple entry tourist visa that expires after 90 days (6 Dec) and it seems that if I leave Thailand and re-enter before 6 Dec. I will automatically be given a 60 day tourist visa at the airport (no charge) which can be extended by 30 days (and payment of another 1900 baht) at the Bangkok Immigration Office. I finished the retreat on the same day as another meditator who completed a one week retreat and she recommended the Wild Orchid Villa on Soi Chanasongkram in Banglampoo near Khaosan road because it is only 10 minutes walk to Wat Mahadhatu where I did the 8 week retreat. This is the first time I ever stayed in Banglampoo, even though I’ve been visiting Thailand since 1981. I previously didn’t like hanging out with the backpackers. This week I made friends with some and found they aren’t all obsessed with beer and cigarettes. Allan from Alaska and Joan from London (via Malaysia and India) have become good friends in the short time I’ve known them. They taught me a lot. I have a small clean room for 250 baht per night with fans (no air conditioning) and must use a common toilets and shower area . All that is fine since I only sleep there and spend most of the day out and about. Actually I’ve spent most of the daytime at Wat Mahadhatu talking with Pi Yai or teaching drop-in travellers wanting to learn meditation or get an introduction to Buddhism. My plans are clearer now though by no means certain. I am following good advice from friends and family not to go to India before the retreat in Myanmar. 1. I would be travelling there alone on the first trip and this is inherently stressful. It may be better for at least the beginning of the first trip to travel in a small group with an experienced person or guide. 2. The weather is particularly hot in late March-April after the moderate temperatures of December-February. 3. My original plan to travel to the main sites in one or two weeks was to cramped with lots of activities in a short period. It would be better to have more time to meditate, read discourses on location and see the less often visited sites. So now I will probably go to India either in October-November 2009 or from late December 2009 to February 2010 with the later period more likely. I’ve done a lot of research on the India trip that I’ve filed away on the portable media player. I can read the maps and notes stored there. I got an Indian tourist visa but now will not use it before it expires. I will have to apply for another Indian tourist visa at a later time. My last day at work is Thursday, 19 March. I shall take my bags to work and go to the Perth International Airport from there. I will fly overnight and arrive in Singapore around 3AM, Friday, 20 March. I may find a cheap place to rest for a few hours. I want to buy some white meditation shirts and other small items at Mustafa’s. I will also go to a clinic to have the JE vaccination and the annual flu vaccination. I was hoping to visit one or two monks in the afternoon. Neither has replied my e-mail yet. Now that may be delayed for another visit to Singapore while something more urgent has appeared. I just found out that a friend’s parents are very unwell and so maybe I will visit them in the afternoon. I fly from Singapore to Bangkok between 6PM and 7:30PM. I plan to take a combination of taxi and train to Ayutthaya, the old capital of Siam, and check in to a guest house before midnight on Friday, 20 March. I will check out from there around Tuesday, 24 March and fly to Yangon. In Ayutthaya I can relax a bit, tour the ruins, visit the museum and just get used to being in Asia before commencing the retreat in Burma. I have a six month meditation visa for Myanmar (Burma). One needs a meditation centre to be a sponsor in order to get a six month or three month (or whatever length) meditation visa. Saddhammaransi Meditation Centre is my sponsor for this trip. Ven. Sayadaw U Kundala has been very sick during the past few years but has recently made a good recovery. A friend who was in Yangon a few weeks ago reported that Sayadaw is up and about meeting visitors and is likely able to talk with me. This is great news for me. I am fortunate indeed. Hopefully, I have learned from mistakes I made on a six week retreat in Yangon two years ago. This time, I have at least six months for the retreat – ten times longer or more. 1. Don’t write a daily journal; and 2. Don’t talk to anyone unless absolutely necessary. These activities involve discursive mental practices which are inherently conceptual and far from observing ultimate realities. Writing and talking are to be avoided as much as possible on Buddhist meditation retreats. Whether samatha or vipassana, the same rule applies. 3. Maintain continuous mindfulness and careful or appropriate attention at all times (sati-sampaja~n~na and yoniso-manasikaara). This is about continuity of mindfulness on the right objects. Try to maintain mindfulness of presently arising and passing phenomena at all times, even when bathing, eating, walking to the interview, sweeping the hall and so forth. 4. Purchase small necessary items at the beginning of the retreat so I don’t need to go to the office and make requests. Being experienced, I know what I need now. 5. Don’t look at other meditators or people at the meditation centre. They have a duty to observe phenomena arising and passing over there. I have a duty to observe phenomena arising and passing over here. I have been anxious about taking the Suttapitaka books on this trip. When planning this trip earlier, I was not sure if I would return to Australia or not. I may meditate most of the time from April to November (or even longer) without any breaks for study or travel (except maybe short distances within Burma to other meditation centres). In that case, I may not need Suttapitaka books. Having them nearby, I may be tempted to read them or refer to them while on retreat. I’ve become quite attached to them during the past two years. They are my dearest possessions. I shall contemplate the parable of the raft and see if I can let them go for a while. I may return for 3 weeks from late November to mid December 2009 to attend my children’s school graduations. One will graduate year 12 and another may (or may not…) graduate year 10. It will mean a lot to them if I can attend. It would cost a lot in airfares though. I checked fares and could not find any discount fares for that period yet. They may be advertised later. Or maybe with the global recession, the cost of flying will increase as the airlines shut down more flights.